The formed plastic sign letters in this typeface are available in the letter heights shown in the listing below. These formed plastic sign letters will have a relatively flat face surface (as compared to round-faced letters or bevel-faced letters) and the letter sides will have a slight outward angle as compared to the "sharp" sides of a Minnesota Brand injection molded plastic letter. 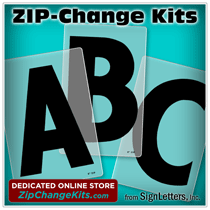 These high quality formed plastic sign letters are produced by experienced craftsmen at Gemini, Inc. (the world leading manufacturer of architectural signage) and will add a professional touch to your dimensional letters. These thermally molded plastic sign letters are routinely used on building signage, either indoor or outdoor. We have separated the listings below based upon which letter style you need.